Once again a very good read. Thank you Bilgerat. What a wonderful tale, I have thoroughly enjoyed reading this "potted history" of HMS Kingfisher. Well researched Bilgerat..
HMS Kingfisher was a Merlin Class, 18-gun, Quarterdeck-built, ship-sloop built under contract by Thomas King at his shipyard on Beach Street in Dover. The Merlin class was a group of 16 ship rigged Sloops-of-War designed by William Rule, Co-Surveyor of the Navy, of which only two were built in Kent shipyards. 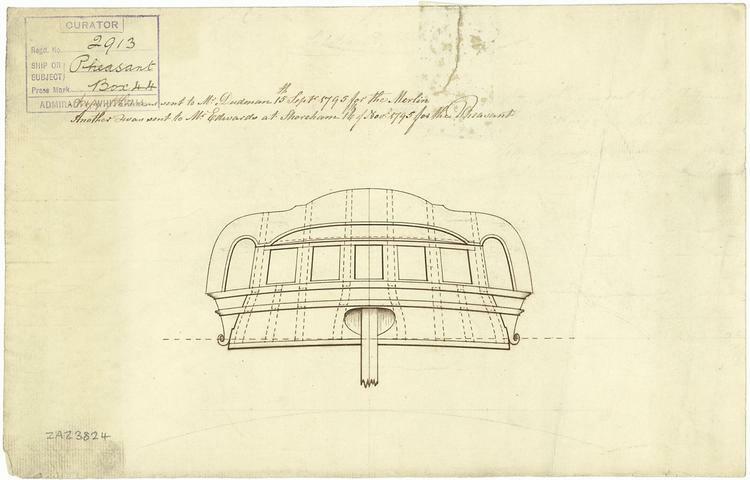 The lead ship of the class had been built under contract by John Dudman at his Deptford shipyard. The term 'Sloop' was used to describe a warship carrying less than the minimum of 20 guns required for it to be rated according to the Royal Navy's rating system. In the case of the Merlin class, they did resemble a small frigate and had a gundeck partially enclosed by a quarterdeck aft and a forecastle forward. 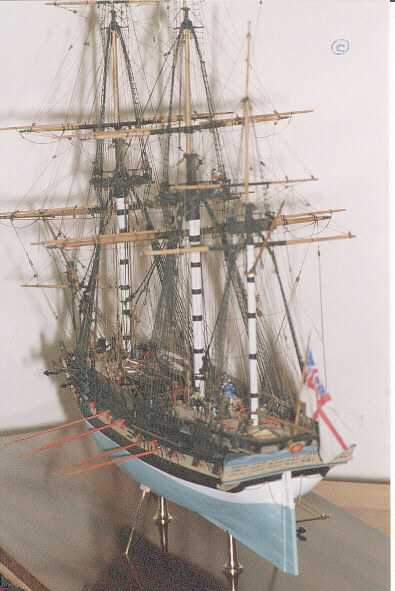 They were built at a time when the flush-decked brig-sloops was becoming very popular in the Royal Navy because of their superior seaworthiness and smaller crews. Despite this and as a result of the shortage of frigates the Royal Navy was constantly struggling with, ship-sloops like HMS Kingfisher were used in roles normally carried out by frigates such as patrolling inshore and scouting for the fleet. 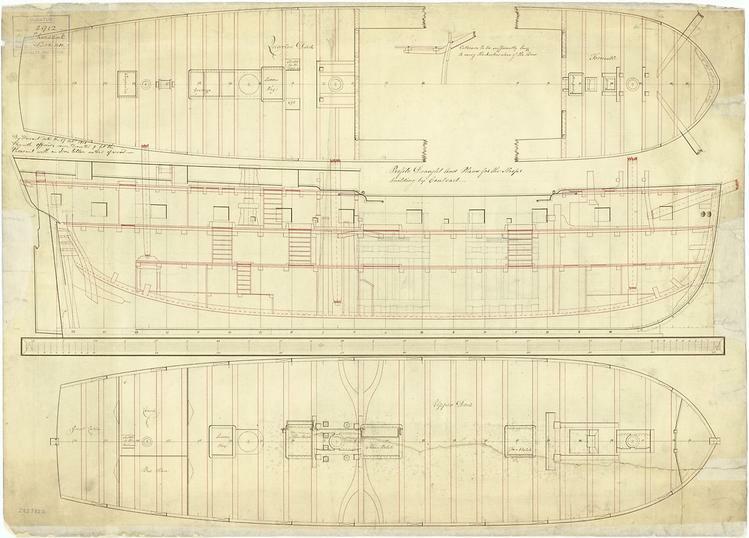 The contract for the construction of HMS Kingfisher (also known in records as HMS Kings Fisher or HMS Kingsfisher) was signed on Saturday 18th November 1802. Her keel was laid at Dover in March 1803 and she was launched with all due ceremony into Dover Harbour on 10th March 1804. After her launch, the ship was taken to the Royal Dockyard at Sheerness where she was fitted with her guns, masts and rigging. When complete, HMS Kingfisher was a ship of 370 tons and was 106ft long on her gundeck and 28' 2" wide across the beam. She was armed with 16 32pdr carronades on her gundeck, 6 12pdr carronades on her quarterdeck and 2 12pdr long guns on her forecastle. Although officially rated as an 18 gun ship-sloop, HMS Kingfisher actually carried 24 guns. She was manned by a crew of 121 officers, men and boys. HMS Kingfisher fitted out at Sheerness between 26th March and 3rd May 1804 and commissioned on that day under Mr Richard Cribb appointed as her Master and Commander. After commissioning, HMS Kingfisher sailed to the Leeward Islands in the Caribbean, where she immediately got stuck into the task of hunting down and taking Spanish and French blockade runners. In January 1805, HMS Kingfisher captured the French privateer Deux Amis of 6 guns. This vessel, ten days out of Guadeloupe, had been chased under HMS Kingfisher's guns by HMS Grenada (10). On 11th May 1805, men from HMS Kingfisher operating from the ships boats launched a cutting-out expedition against an anchorage off Cape San Juan, Puerto Rico. They succeeded in boarding and capturing the Spanish privateer Damas. Although the boarding party came under fire from the shore, they got away with their prize without suffering any casualties. On 27th June, operating in company with the 18 gun ship-sloop HMS Osprey, the two ships found themselves being chased by two much larger and much more powerful French frigates. Despite making all sail, the two sloops were unable to get away, so they began to make signals to non-existent ships, apparently over the horizon, out of sight of the French ships. This had the desired effect, the two Frenchmen thought the British sloops were signalling to a fleet out of their own sight and gave up the chase. This enabled the two British sloops to fall upon a convoy of 15 enemy merchant ships carrying cargoes of rum, sugar and coffee. By the time HMS Kingfisher and HMS Osprey left the scene, all 15 ships were burning. In June 1805, Commander Cribb died. It is unclear what he died from but since there are no records of HMS Kingfisher being in action at the time, it is likely that he died from either Malaria or Yellow Fever, the two biggest killers of Europeans in the Caribbean at the time. He was replaced in command by Mr Nathaniel Cochrane on 30th July 1805. HMS Kingfisher was Cochrane’s first command. After 5 months in command, Cochrane had his first success in HMS Kingfisher when, after a chase lasting 12 hours, on 16th December 1805 they captured the French privateer Elisabeth off Guadeloupe. Elisabeth was a fine prize. This vessel was armed with ten 6pdr guns and 4 12pdr carronades. She usually carried a crew of 121 men, but had sent away a prize crew of 11 men aboard the British cargo ship Cambrian, which she had captured on 28th October. Cochrane considered the Elizabeth to be a fine vessel and on his recommendation, the vessel was purchased by the Admiralty and was commissioned as HMS Elizabeth. Later the same day, in company with the 28 gun frigate HMS Hyaena, HMS Kingfisher captured a Spanish Polacca bound for Vera Cruz. On 28th December, HMS Kingfisher in company with the 22 gun ex-French privateer brig HMS Hereux, captured the Spanish brig Solidad, bound for Vera Cruz from Cadiz with a cargo of brandy and wine. In December 1805, a powerful French squadron of ships of the line, led by Vice-Admiral Corentin Leissegues in the massive 120 gun ship Imperial had broken out of Brest with the intention of disrupting British trade routes and convoys in the Atlantic Ocean and Caribbean Sea. The French squadron had been followed across the Atlantic by Vice-Admiral Sir John Duckworth, flying his command flag in the Northfleet built 74 gun third rate ship HMS Superb. In January 1806, HMS Kingfisher was ordered to join Duckworth’s squadron and start scouting for the French squadron, while Duckworth resupplied his ships at St Kitts. HMS Kingfisher investigated reports of three French ships of the line being sighted off San Domingo. Cochrane returned to St Kitts and passed his intelligence along to Vice-Admiral Duckworth, who set sail to confront the French. The French force, on spotting Duckworth’s squadron left the harbour at Santo Domingo, formed a line of battle and sailed to meet the approaching British force. Keeping a tight formation, Duckworth's ships successfully engaged the leading ships of the French line, targeting the Imperial. Under pressure, the French line fragmented, with the British isolating and capturing three of their ships before Duckworth ordered his ships to concentrate on the Imperial. To avoid being captured, the Imperial and another French ship, the Diomede, were driven ashore. Although most of the crews of the French ships got away, British boarding parties successfully captured both ships and set them on fire. Vice Admiral Duckworth had incurred his commander-in-chief's anger at abandoning his station, blockading Cadiz. It was only his victory at the Battle of San Domingo which pursuaded Vice-Admiral Lord Collingwood not to order his Court Martial. The battle was the last time that British and French ships met in a set-piece naval battle. The Royal Navy's total blockade of French ports and the seemingly inevitable French defeat made the French stay in their ports for the rest of the war. HMS Kingfisher was far too small and frail to take part in the actual battle, although Commander Cochrane and his ship were particularly praised by Vice-Admiral Duckworth for their role in the lead-up to the battle and Cochrane was personally rewarded with a promotion to Captain. Her crew were rewarded with a share in the prize-money for the capture of the French ships of the line Brave, Alexander and Jupiter. On his promotion to Captain, Cochrane was given command of the 74 gun third rate ship HMS Northumberland, while one of HMS Northumberland’s First Lieutenant, Sir George Seymour, was appointed Master and Commander in HMS Kingfisher. Seymour went on to have a long and distinguished career in the Royal Navy, rising to become Admiral-of-the-Fleet, but in March 1806, was ordered to take HMS Kingfisher back to the UK to join the Channel Fleet. On 14th May 1806, HMS Kingfisher was operating in company with HMS Pallas (32) under the famous Captain Thomas Cochrane (no relation to HMS Kingfisher’s earlier commander). The two ships were ordered to keep an eye on a French squadron in the anchorage off the Ile d’Aix. Cochrane had hatched a plan to try to entice some of the French ships out and engage them. Seymour, known by this time to be willing to take excessive risks, had been ordered by the overall commander of the force, Vice-Admiral Thornborough, not to pass the Chassiron light house. Cochrane anchored HMS Pallas within range of the French shore battery on the Ile d’Aix. The French Admiral, realising Cochrane’s audacious plan, duly obliged and sent an overwhelmingly superior force to chase off the British frigate and her smaller consort. The French force comprised the frigates Gloire (44), Armide (40), Infatigable (40), La Minerve (36) and the 16 gun brigs Palinure, Lynx and Sylphe. The French plan was that the Minerve and the brigs should attack HMS Pallas while the other ships be held in reserve, ready to join the action at short notice. Cochrane, in HMS Pallas, weighed anchor and awaited the French attack. The French vessels came up with all sail set. Cochrane opened fire as soon as he was able and immediately put one of the brigs out of action. He then engaged Minerve and another of the brigs but was unable to keep up a constant stream of fire as all the ships had to tack frequently to avoid shallow water and rocks. Eventually, after about 2 hours of fighting, at approximately 13:00, Cochrane succeeded in working his ship up-wind of the Minerve and put three broadsides into her. This had the desired effect and the Frenchman ceased fire and appeared to be turning away. Cochrane decided to turn his ship into the Minerve with the intention of boarding her. What he didn’t know was that the Minerve had run aground so when HMS Pallas turned in, she rammed the French ship at speed. HMS Pallas was severely damaged by the collision, losing her fore-topmast, most of her bowsprit. Such was the force of the collision that HMS Pallas’s guns were driven back into their ports. The force of the impact was such that the crew of the Minerve were unnerved to the point where almost all of them fled below. HMS Pallas’s crew set to work clearing away the wreckage on the deck in preparation for boarding the French ship. It was at that point, that the French frigates Armide and Infatigable were seen preparing to come to the Minerve’s aid. Cochrane decided that there was nothing for it but to withdraw. 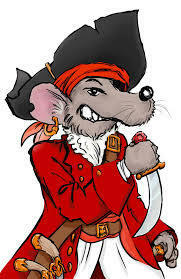 Seymour in HMS Kingfisher on seeing that Cochrane was in trouble, decided to disobey his orders and took his ship past the lighthouse with all sail set and came to HMS Pallas’s assistance, passing a tow cable. The French, meanwhile, were stunned to see the small British sloop deliberately sail under the guns of the shore battery, towards three much larger and more powerful ships and tow away HMS Pallas. This was despite the fact that any one of the French frigates was more than a match for the combined guns of both British ships. On 29th July 1806, Commander Seymour was promoted to Captain and given command of HMS Aurora (32). He was replaced in command of HMS Kingfisher by Commander William Hepenstall. In October 1806 Hepenstall was ordered to take HMS Kingfisher into the eastern Mediterranean. Further success evaded HMS Kingfisher until 27th June 1808, when she sighted the French privateer Hercule, chased that ship for six hours and captured her after a fight lasting an hour. Hercule was carrying a cargo of cotton from Aleppo to Marseilles and was also armed with 12 guns including an 18pdr. Hepenstall remained in command until 21st January 1809 when he was replaced in command by Commander Ewell Tritton. On 12th March 1809, HMS Kingfisher operating in company with HMS Topaze (38), chased and attacked the French frigates Danae (44) and Flore (40) in the Adriatic. Despite the huge French superiority in firepower, both British ships escaped without damage, with the French ships, presumably under orders not to fight, also escaping. On 3rd October, HMS Kingfisher was present when British forces captured the port of Zante. On 29th November 1811, HMS Kingfisher was present during an action in the Adriatic between a squadron of British frigates and one of French frigates. During the action, HMS Active (38) had forced the surrender of the French frigate Pomone (40). Unfortunately, HMS Active was in no condition to board the Pomone, so she was taken in tow by HMS Kingfisher, whose crew took a share of the prize money. On 29th January 1813, HMS Kingfisher in company with HMS Cerberus (32) when they captured the cargo ship Madonna della Grazia. On 2nd February, HMS Kingfisher’s men operating from the ships boats captured a Trabaccolo and drove ashore another 9, destroying 5 at St Catherines, Corfu. In August 1813, HMS Kingfisher was ordered to return to the UK and arrived at Portsmouth on 4th September, when she paid off. In 1814, HMS Kingfisher was placed in the Ordinary at Portsmouth and the ship was broken up there during October 1816.